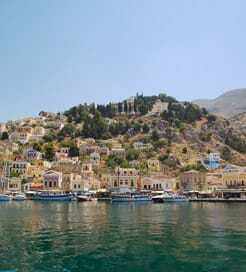 There are numerous ferry crossings operating from Dodecanese Islands to Crete. Ferries currently connect 5 ports in Dodecanese Islands with 2 ports in Crete. There are a combined number of 20 ferry crossings each week across a selection of 10 Ferry Routes which are operated by 1 ferry company including Anek Lines with the shortest crossing taking around 2 hours 45 minutes (Kasos to Sitia). This is a general summary of the services on offer between Dodecanese Islands and Crete, for live information select from our Fare Search. 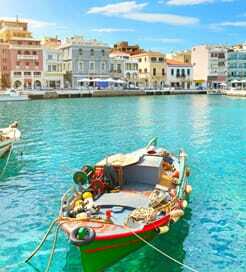 The twelve Dodecanese Islands lie in the southeast corner of the Aegean Sea, boasting one of the sunniest climates in Greece. As diverse as they are beautiful, the Dodecanese are the complete Greek package offering a wide range of attractions including stunning beaches, exquisite food, historic wonders and architectural masterpieces. The most visited and popular island, Rhodes is rich with medieval history and offers the perfect setting for romantic strolls in its famed Old Town. Thrilling activities come in abundance on the Dodecanese, too, particularly on Telendos, where you can scuba-dive through an ancient sunken city. The Dodecanese Islands offer plenty of great departure points for numerous European destinations, as well as frequent routes within the islands themselves. Due to the quantity of islands in this region, travelling by ferry is by far the most convenient way to get around. Known for its varied landscapes comprising fertile valleys, stunning beaches and the famous White Mountains found alongside idyllic harbours and sleepy villages, Crete has beautiful backdrops around every corner. Numerous time-honoured traditions remain fundamental to Cretan culture, including Easter feasts, playing stringed instruments called ‘lyra’ and performing spectacular local dances. Some Greeks even say Crete could be its own country due to its diverse terrain and the unique way of life. There are many domestic ferry routes departing the mainland and surrounding archipelagos in the Aegean Sea, arriving at the five Cretan ports on the north coast, including the capital, Heraklion. These sailings have varying journey times and are run by multiple operators, so there’s ample choice when it comes to reaching Crete by ferry.